April 4, 2018 (LifeSiteNews.com) – Politifact sounds unbiased and sooooo journalistic. But it's often not – especially when the "fact-checkers" are the same dishonest journalists who daily deliver deception in the form of fake news. "Politifact is non-partisan" or so it says. Sure. And Hollywood is politically diverse. The self-anointed "fact-check" operation explains its mission is to "sort out the truth in American politics." There's obviously a typo in there. I'm pretty sure they meant, "filter out." Politifact was created by the Tampa Bay Times ... which needs some serious fact-checking itself (see here). In a recent Politifact "fact-check", State Representative (R-TX) Jason Isaac makes Mostly False claim that abortion is the leading killer of black Americans, W. Gardner Selby plays a pathetic game of semantics to arrive at a false conclusion about abortion's impact in the black community. 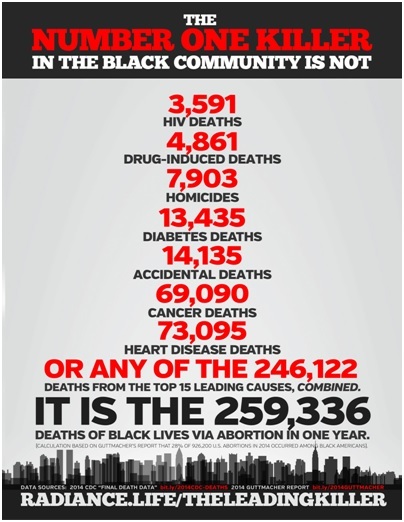 Abortion-induced deaths of the unborn in the black community are 69 times higher than HIV deaths, 31 times higher than (all other) homicides, 3.6 times higher than cancer-related deaths, and 3.5 times higher than deaths caused by heart disease. Selby, preferring euphemisms over the literal meaning of words explains: "But it's worth noting for starters that Isaac's characterization of abortions as killing babies is disputed." Disputed by whom? Those who unscientifically say unborn children are just clumps of cells? Political activists, like former Planned Parenthood President Cecile Richards, who say protesting an abortion is like protesting a man's colonoscopy? Selby justifies such "dispute" by referring to pro-abortion activists who "refer to unborn fetuses". That changes nothing. Fetus is simply Latin for offspring. The offspring of humans are…humans. Embryology is unambiguous when it comes to this century-long known fact: human life begins at fertilization. Any act that intervenes and terminates that life prior to birth (such as miscarriage or induced abortion) causes the death of that human life. "We of today know that man is born of sexual union; that he starts life as an embryo within the body of the female; and that the embryo is formed from the fusion of two single cells, the ovum and the sperm. This all seems so simple and evident to us that it is difficult to picture a time when it was not part of the common knowledge." These were words published in 1933 by Guttmacher founder, OB/GYN and Planned Parenthood President – Alan F. Guttmacher – in his book Life in the Making. Today, the pro-abortion Guttmacher Institute and its media allies ignore this irrefutable scientific fact. Selby then protests: "The CDC doesn't say abortions kill babies." Does the CDC need to tell us blue is a color, too? His attempt to defend abortion and willfully ignore what it actually is is mind-numbing. But that's the point of today's agenda-driven #fakenews – to numb the minds of the public to the violent atrocity of abortion. Sure, in its annual Abortion Surveillance Reports, the CDC offers this clinical definition of abortion: "For the purpose of surveillance, a legal induced abortion is defined as an intervention performed by a licensed clinician that is intended to terminate an ongoing pregnancy." Yet, the Merriam-Webster dictionary, which has been around a lot longer than the CDC, defines abortion this way: the termination of a pregnancy after, accompanied by, resulting in, or closely followed by the death of the embryo or fetus such as the induced expulsion of a fetus. The CDC provides such an antiseptic definition when it comes to ending the life of an unborn child via induced abortion. But when discussing prenatal care or pregnancy loss, 'baby' magically adorns every discussion. "The loss of a baby during pregnancy remains a sad reality for many families" explains the CDC on its Pregnancy Loss page and describes a stillbirth as "the death of a baby beforeor during delivery." Mothers are warned against smoking because it can "separate the placenta from the womb too early, causing bleeding, which is dangerous to the mother and baby." There the CDC goes again conditionally acknowledging the humanity of something Selby likes to pretend is not alive. Interestingly, Selby mentions short gestation and low birth weight (the result of preterm births) as 22% of the cause of post-birth infant mortality. Preterm births also cause birth defects like cerebral palsy, developmental delays, as well as vision and hearing problems. This meta-analysis, citing 49 studies, showed that "black American women have triple the risk of Early Preterm Births and quadruple the risk of Extreme Preterm Births, compared with non-black American women." These studies showed preterm births were significantly increased by previous induced abortions. 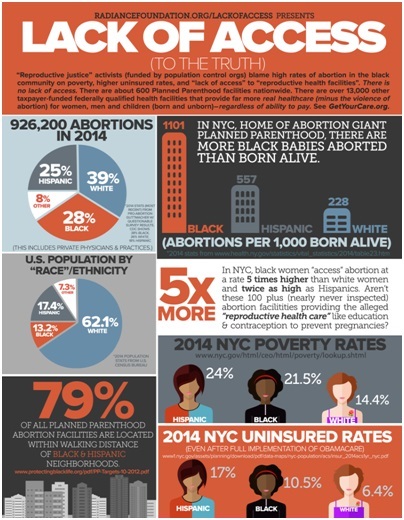 According to the CDC, black women have triple the abortion rates of white women. The Institute of Medicine (IOM) of the National Academy of Sciences, like many other prestigious medical organizations, hides abortion data…you know…because they trust women. 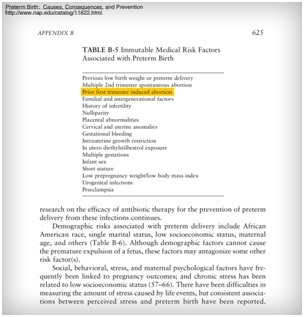 Buried on page 625 of this IOM study is Table B-5 which lists the "Immutable Medical Risk Factors Associated with Preterm Birth". The third risk factor listed? Prior first trimester induced abortion. This crucial fact is mentioned nowhere else in the entire study. Now, is this science or is this politics? Yet Guttmacher, which Politifact religiously regurgitates as irrefutable fact, made these false claims about induced abortion's impact on women: "Abortions performed in the first trimester pose virtually no long-term risk of problems such as infertility, ectopic pregnancy, spontaneous abortion (miscarriage) or birth defect, and little to no risk of preterm or low-birth-weight deliveries." Politifact (aka Politifiction) simply operates with the same DNA as its creator. Mainstream media needs to stop pretending it exists to inform the public. The Radiance Foundation gives Selby's "fact-check" a Mostly Political rating, which for the rest of us means Liar, Liar, Pants on Fire.